Mohini is a pepper of medium pungency, best used fresh. 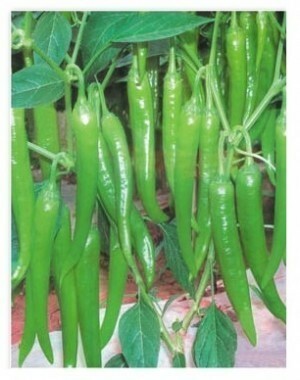 Light green fruit with a horn shape, fruit length aprox 6 inches and 1/2 in wide, with high density of fruits produced on sturdy plants. Thin peeled and crisp they can be eaten raw or for cooking, pickles, and processing. Early maturing plants with vigorous growth. High disease and heat resistant plants.